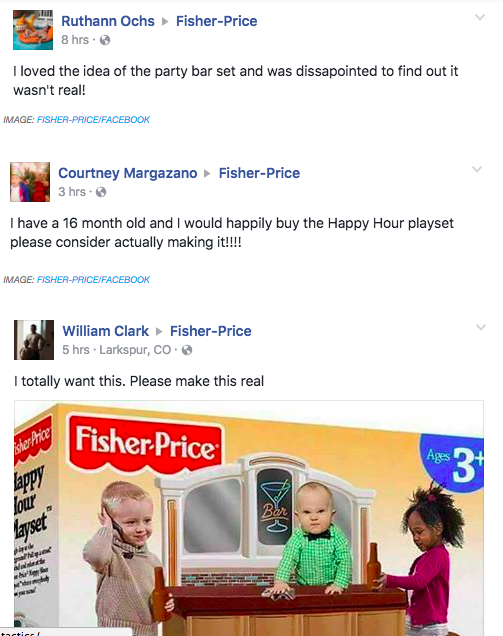 Would You Buy Your Kids The 'Happy Hour' Playset? Toddlers standing around a bar, sipping beers… probably not the playtime scenario mums have in mind for their little ones. 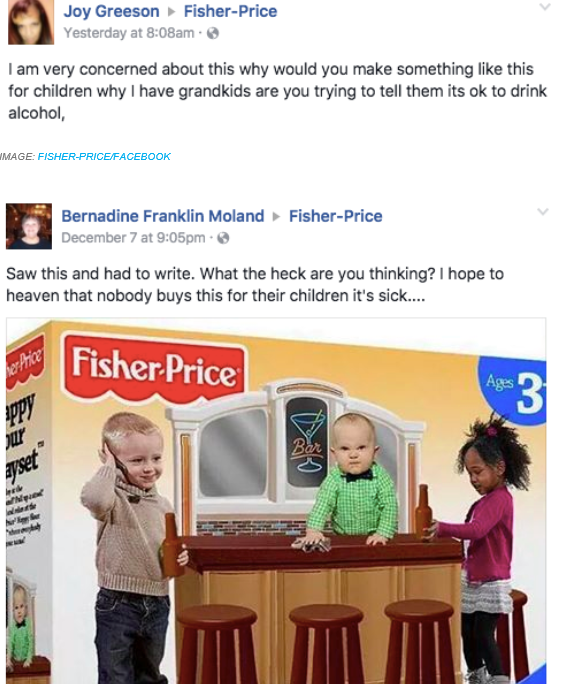 Fisher Price would’ve got the shock of their lives recently when fake, photoshopped images of their so-called ‘Happy Hour Playset’ surfaced on social media. The playset, which shows (pretty hilariously if you ask us), a grumpy looking baby playing the bartender wiping down the counter, and two other children holding beer bottles. Many parents, fooled by the trickery of Adam Padilla’s Instagram account, flooded Twitter and Fisher Price’s Facebook with angry comments claiming that such a toy would encourage bad habits in children. Padilla spoke to Mashable about the image that caused such a kerfuffle. He said: “My 21 month-old daughter gave me the idea while playing on her kitchen playset at our apartment. I mentioned to my wife, Willow, that it would be hilarious if a major toy company created a bar set for toddlers. Whom wants this for Xmas? ?? After it was revealed as a fake, some people adopted a far stronger sense of humour. We’ve had a giggle about this at the ellaslist office, but have to admit, blew a secret sigh of relief when we confirmed it was all just a joke. Beware the dangers of photoshop!